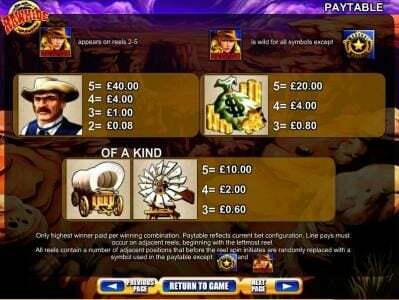 Rawhide online slot machine pictures and slot feature list from WMS, play Rawhide Slots for free. 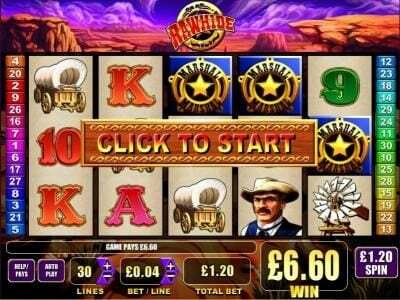 Rawhide Slots has not been reviewed yet, be the first to rate this slot. 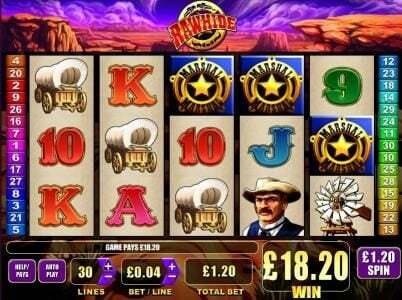 Rawhide, a wms video Slot, offers 30 paylines on 5 reels. 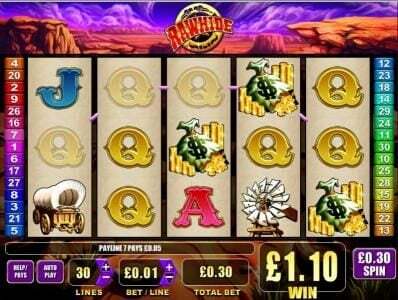 You will find this game’s features to include free spins, scatters, multipliers and wild symbols. The top jackpot offered in Rawhide is valued at $5,000. 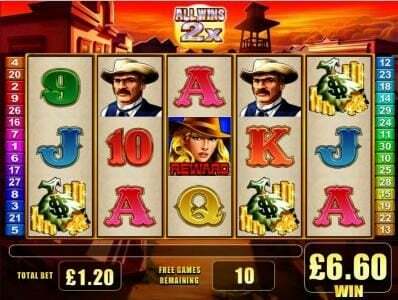 The game is themed around an old TV show, a western that was quite popular back in the day. Unfortunately, while the western theme is quite attractive for a lot of people, the design of this game suffers and it would’ve benefitted from a bit more work. You should give this game a try though, as it offers everything a fan of the Wild West needs, from the magnificent vistas to heroic sheriffs, bags of gold and beautiful girls. The symbols of the game include a sheriff, girl, badge, bags of gold, a wagon, windmill and the playing cards from 9 to Ace. Placing a bet in Rawhide is easy enough. It starts with the choice of the number of paylines which should be selected, the range being between 1 and 30. Next, comes the coin value which is in the $0.01 to $5 range. 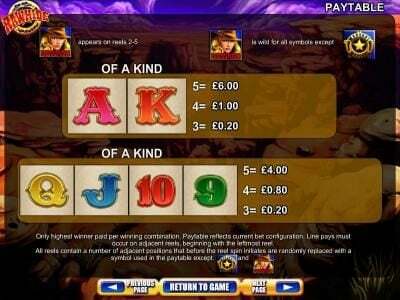 The maximum bet that the player will place in this game is $150, while the top jackpot goes up to $5,000. The player will need the symbol with the sheriff in order to win the jackpot, and it has to be five of these symbols on the same line. The wild symbol is the image of the cowboy girl, which has the word Reward written on it. It substitutes for the various other symbols in the game, and it can even help you get the top jackpot if it’s in the right place. The wild will not be able to substitute for the Marshal symbol (scatter). 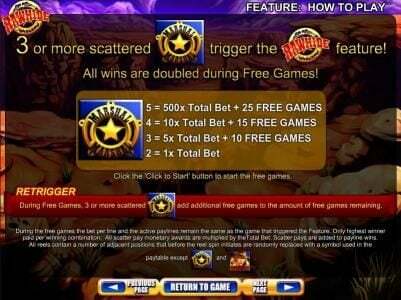 With the help of the scatter, the player can gain access to a round with 25 spins for free, plus 2x multipliers. Three scatter symbols need to be on the reels for this feature to be activated. To top things off, there are also progressive prizes offered to the player, a total of five jackpots that are up for grabs. The wild west theme should be a good enough reason to give this game a try, but it doesn’t stop there. It also offers progressive prizes and a decent Free Spins feature.